The first proposal for Interstate 494 was upgrade Lake Shore Drive into an Interstate-standard facility. Lake Shore Drive, which carries U.S. 41 through Chicago, was originally constructed in 1933 from Belmont Avenue north to Foster Avenue. This prototype expressway was among the first to feature certain limited access features such as grade separations. The parkway extended south toward the Loop. Planners called for Lake Shore Drive to be brought up to Interstate standards with an expressway connection from Interstate 94 to Lake Michigan at both the south and north ends of the roadway. The connecting routes from Lake Shore Drive – Stony Island Road from I-94 (Bishop Ford Expressway) and the vicinity of Foster Avenue or Peterson Avenue from I-94 (Edens Expressway), were never built. Rand McNally 1969 and 1972 Chicago and Vicinity maps showed Interstate 494 cosigned with U.S. 41. It is unlikely this pairing was ever signed along Lake Shore Drive. Lake Shore Drive was subsequently never improved to Interstate standards, and today the highway remains substandard. The Crosstown Expressway was a proposed urban freeway loop offering an alternate route around Downtown. The expressway would have begun at Interstate 94 (Dan Ryan Expressway) at the exchange (Exit 96C) with 75th Street and follow the 75th Street corridor west via the Belt Railway of Chicago. 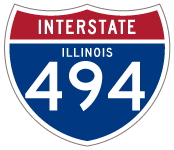 Turning north, Interstate 494 (Crosstown Expressway) would have run parallel to Kolmar Avenue, which is located just east of Illinois 50 (Cicero Avenue). The projected path of Interstate 494 continued northward along the Belt Railway of Chicago, roughly following Kenton Avenue to I-90/94 at the point where the Edens Expressway splits from the Kennedy Expressway (Exit 43A). This alignment appears on a 1971 Chicago and vicinity General Drafting road map. Moberly, Bob. “Interstate Guide Comment.” Personal Email. January 4, 2008. Page updated April 22, 2008.